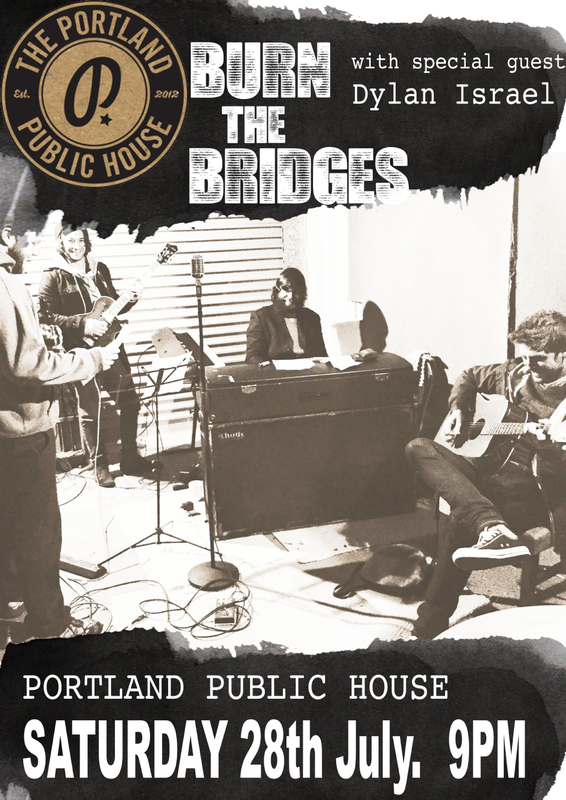 Burn the Bridges will be bringing their unique blend of blues, rock, country and handsomness to the Portland Public House in Kingsland, Sat July 28. It’s a full moon out so things are liable to get interesting. So come on down, kick ya heels up and get amongst. With special guest Izzy Bones, and free on the door, you cant afford not to! Here's some more info on the bands. Burn the Bridges play an original mix of musical styles out of the American South-West. Playing styles ranging from Blues and Rock n' Roll to Folk'y Country tunes. The wide range of styles always makes for a good night and a good dance floor, with some slow jams to warm you up, a bit of funk to get your feet moving and some good old rock n roll to really kick your heels! Izzy Bones tastes are wide and cover many genres as seen by his eclectic mix of bands and projects. Having played acoustic gigs since a teenager he is still playing acoustic shows today incorporating a good portion of originals and covers that you wouldn’t expect with a jazzy reggae feel and husky vocals sure to take you on a journey.